Did you read the interesting account of a mom from Alberta who went on a strike to make her children understand the importance of doing their chores? As expected, the kids would have been surrounded by quite a lot of chaos before getting the message. Are there times you feel like cleaning your home is such a big chore, that you would rather go on strike? One way to make your task easier is to pick up an appliance like a steam mop that helps keep your floors clean in a much easier manner. Ease of use: The ideal steam mop is much easier to use than a conventional floor mop, as there is no need to lug along a water storage bucket, or to dip the mop and squeeze out excess water from time to time. You can just fill water in the required compartment, wait for it to heat up and start using; and then use continuously depending on the capacity of the mop. It requires a lot less bending and stretching than other methods of cleaning and is comfortable to use even for senior citizens. The existence of a swivel head makes it possible to clean out the difficult to reach corners too. Chemical free: It is very difficult to get a clean floor without using any chemical additives, and we all know how strong smelling and unhealthy some of these can be. Using the right steam mop makes it possible to clean even spots or messes using just tap water and the high temperature even kills most germs making your home a healthy environment for you and your family. 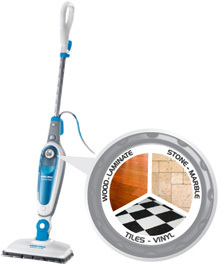 Modes of use: Another great feature to have is for your mop to have smartness built into it too. Depending on the type of floor you have, you can just choose the required setting and the mop will release the required amount of steam needed to clean your floor. This saves a lot of effort of worrying about the gradation or how strong the steam is, and using it in different areas of your house where you might have different flooring such as wood becomes a breeze.